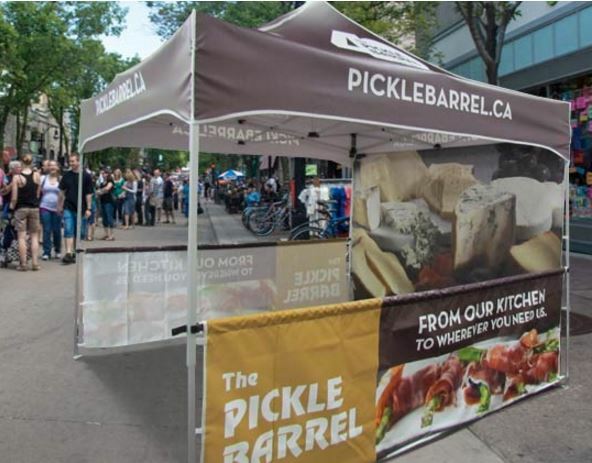 We may be best known for our unique pop-up canopies but trust us, we know a thing or two about making those pop-up canopies stand out even more with a variety of accessories. Add a side panel, a rail curtain, a table cover or even a chalet top & your custom set-up just went from good to outstanding. Getting these accessories to look good will come partially from you but don’t worry, it’s easy. We do the hard part-the printing, all in house too. Luckily, our accessories are designed with as much ease of use in mind as our pop-ups canopies. Find out more about each accessory below and keep in mind, ‘accessories are the important details needed to complete each look’. How do they attach? With a hook-and-loop attachment (easy to add to any canopy frame) or upgrade to zipper attachments! What sizes do they come in? 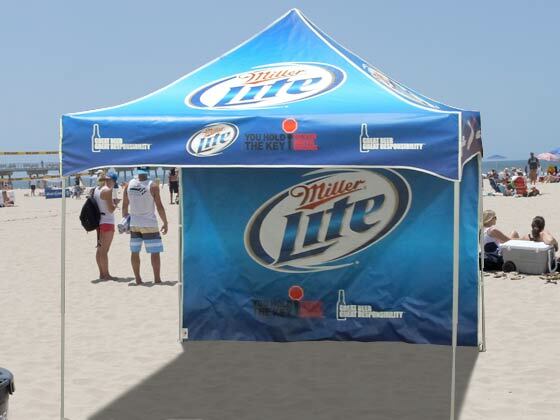 All sizes of our Majestic canopies, Party Shade canopies (digital printing only on 10×20 size) & all sizes of the Star Shade canopies. What other options do you have? Choose the custom printing option or from one of the 17 bold color choices, add an open serving window (or 2! ), a clear upper panel, or a zipper opening. How do they attach? An aluminum support rail attaches to the canopy legs without tools & hook-and-loop side straps keep the rail curtain in place. Why should you get one? 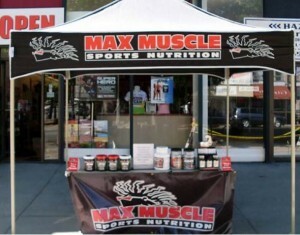 To partially enclose your canopy and channel traffic while still providing airflow and allowing customers to see inside. What sizes do they come in? They are 30” high & the telescoping rails will work with 5’, 8’ and 10’ canopy leg spans. What other options do you have? Choose the custom printing option or from one of the 17 bold color choices. Watch the how-to set up video here! How do they attach? Pull the fitted table cover over a folding table & voila! Why should you get one? Add some pizzazz to a beat-up folding table. Set your products on something that makes them look even better. What sizes do they come in? We make them in 4’, 6’ and 8’ sizes to fit standard-sized collapsible banquet tables. They are 29.5” high. What other options do you have? Choose between a fitted or a stretch-fit style, add graphics or choose from 17 bold color choices. Click here to watch a how-to set up video! 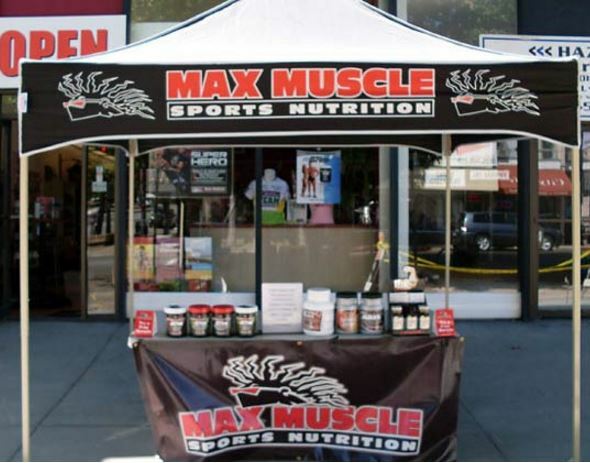 Give your canopy frame a makeover! These fancy tops are compatible with any of our 10’x10’ canopy frames and fit the frame from top to bottom. 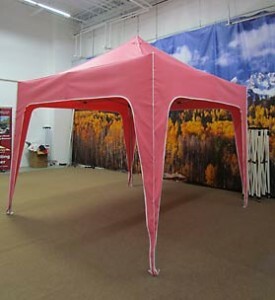 Since they’re made using the same material we use for canopy tops, they are strong, lightweight, water-resistant, fire-retardant & UV-protected.